At Ester Electrical we take a different approach to test tagging. All our test tagging jobs are done on a charge up basis- we charge a pre-determined hourly rate, we charge a minor sundries charge per tag and if possible make onsite repairs to your non-compliant equipment to get it up and running, minimising disruption to your business. Other franchised test tag companies often charge an unfairly large test rate per appliance and leave you with non-compliant tools that are often easy to repair to make safe and compliant. We systematically log and record all our tags and provide you with a comprehensive report on any issues found with appliances. Why do you need to test and tag your electrical equipment? Under current health and safety requirements, New Zealand businesses must take steps to ensure their workplace is safe for everyone, including staff and customers. However, what is not always clear is what ‘must’ be done and what is ‘good’ to do. We want to help you understand not only what you need to do but how it should be done so that you can make an informed decision. The Electricity (Safety) Regulations 2010 is the legislation that dictates that businesses and organisations need to ensure the electrical fittings and appliances that they provide for the use of the staff, visitors or the public are electrically safe. 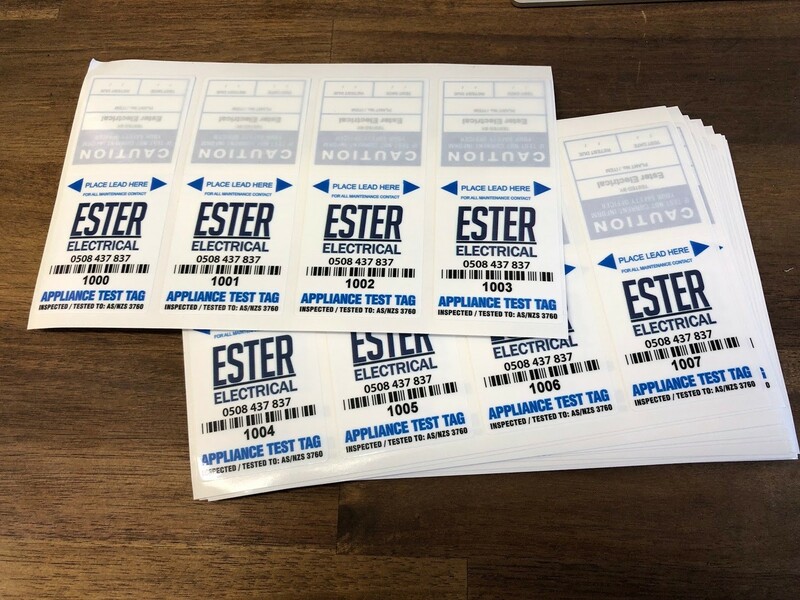 By having Ester Electrical carrying out your testing and tagging in accordance with AS/NZS 3760 you have a reference of how the testing has been done; as well as guidance for when it should be tested again based on the environment it is used in. If your testing is conducted another away (not in accordance with AS/NZS 3760), then you may find that if there is an incident, you may have to justify why an item was tested a particular way and what reference was used to deem it electrically safe.